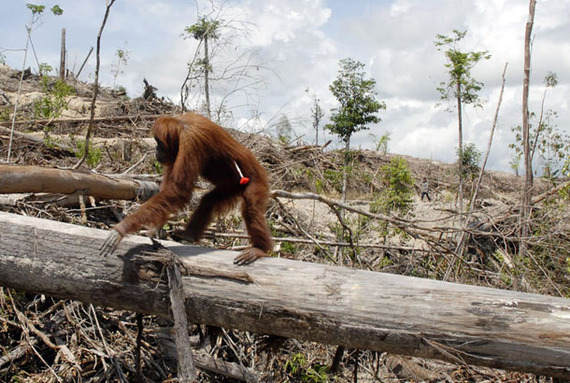 KFC, Pizza Hut & Taco Bell Commit to Deforestation-Free Palm Oil. Who's Next? Kentucky Fried Chicken may have changed its name to KFC years ago to downplay its cooking method in a more health-conscious consumer market, but the world's second-largest fast food chain didn't stop frying. And like most global fast food restaurants, its oil of choice has historically been palm oil. From a purely business perspective, that makes sense. Palm oil is cheap, naturally saturated, and free of trans fat, and it's used in a wide range of baked goods, packaged foods and personal care products. But from a broader perspective, all too often it's a disaster. Oil palm trees only grow in the wet tropics, and growers routinely destroy tropical forests to plant them, releasing massive amounts of carbon into the atmosphere. Some palm oil plantations in Southeast Asia also devastate critical habitat for elephants, orangutans, rhinoceros and tigers. And still others steal land from local communities and exploit child labor. KFC's parent company, Yum! Brands, which also owns Pizza Hut and Taco Bell, announced today that by the end of 2017 it will only buy palm oil cooking oil from suppliers that protect tropical forests and peatlands--swampy areas that store even more carbon. That's a big deal. Yum! Brands has more than 41,000 restaurants in more than 125 countries and territories around the world. Yum! Brands' announcement comes just a day after the Union of Concerned Scientists (UCS) released a report analyzing top companies' palm oil commitments. It's a follow-up to the organization's March 2014 report that rated the 10 largest companies in the packaged food, personal care and fast food sectors on their professed plans to use deforestation-free, peat-destruction-free palm oil that is traceably and transparently sourced. At the time, the packaged food companies had the strongest standards. Fast food companies had the weakest. The new report tracks the 30 companies' progress over the last year and adds a fourth category, the house brands sold by the 10 largest supermarket, pharmacy and discount store chains. Only eight of the 40 companies surveyed this year have adopted palm oil commitments that fully protect forests and peatlands. Those companies are ConAgra, Danone, Kellogg's, Nestlé and PepsiCo from the packaged food sector, and Colgate-Palmolive, Henkel and Procter & Gamble from the personal care sector. Fast food chains, despite today's Yum! Brands announcement, are still lagging far behind, and store brands are just as bad. Besides Yum! Brands, whose welcome announcement came too late to include in the updated UCS scorecard, the lone bright spot over the last year in the fast food sector was Dunkin' Brands, the parent company of Dunkin' Donuts and Baskin-Robbins. The company was one of the eight fast food chains, including Burger King, Starbucks, Wendy's and Yum! Brands, that scored zero in UCS's March 2014 review. But last fall Dunkin' Brands announced it would buy only 100 percent deforestation-free palm oil by 2016 for its U.S. locations and provide a schedule for its global operations sometime this spring. McDonald's, which recently got some good press when it announced it will stop selling chicken treated with antibiotics, didn't score zero, but it's still a prominent laggard. The world's largest fast food chain says its goal is for 100 percent of its palm oil to be "verified as supporting sustainable production by 2020," but UCS found its plans to meet that goal woefully inadequate. Burger King, the world's third-largest fast food chain, inched up from zero in 2014 to 10 out of a possible 100 in UCS's new scorecard, which is still pitiful. Five years ago, the company pledged to review "its overall rainforest policy to include all of its products," but it has yet to come up with a policy. The packaged food sector, meanwhile, is still setting the pace. Nestlé, Danone and Kellogg's had the highest scores in this year's survey, and the three companies -- along with ConAgra and PepsiCo -- strengthened their pledges to protect forests and peatlands over the past year. Kraft Foods, which recently announced plans to merge with Heinz to form the third-largest U.S. food and beverage company, was the worst of the lot. It has no palm oil policy. Heinz has a written commitment, but it does not ensure that tropical forests and peatlands will be protected. The most-improved category in UCS's survey was the personal care sector. Last year, L'Oréal was the only company in this sector fully committed to forest and peatland protection, with Reckitt Benckiser, the maker of Clearasil and Veet, not far behind. Over the past year, three other companies -- Colgate-Palmolive, Henkel and Procter & Gamble -- joined them by making strong forest- and peat-protection commitments. This year, UCS decided to add the store brands produced by top supermarket, pharmacy and discount store chains to its palm oil scorecard. Twenty-five percent of the products sold in large supermarkets sport a store's house label, according to the Private Label Manufacturers Association, so these chains could play a sizable role in helping reform the palm oil industry. Unfortunately, most store brand products don't measure up. Safeway is the only one of the 10 companies that is fully committed to deforestation- and peat-free palm oil. Three other companies--Kroger, Walmart and Whole Foods--have made palm oil pledges, but they are relatively weak. Given that Walmart launched a sustainability initiative to great fanfare 10 years ago, and Whole Foods is ostensibly all about sustainability, their assurances are surprisingly feeble. Over the last two years, the international campaign to protect tropical forests from unscrupulous palm oil plantation owners has made considerable progress. Public pressure prodded Wilmar International, the world's largest trader; Golden Agri-Resources, Indonesia's largest producer; and vegetable oil giants Bunge and Cargill to commit to stop selling palm oil linked to deforestation or peatland development. And just this week, Archer Daniels Midland, a large palm oil and soy trader, announced it will "build traceable and transparent agricultural supply chains that protect forests worldwide." Together, the five companies represent more than half of the global palm oil trade. Advocacy groups and hundreds of thousands of citizens also have pressed consumer product companies to adopt palm oil standards. Since last fall, Dunkin' Brands, Krispy Kreme and Yum! Brands joined their ranks. Still, only eight of the 40 companies in UCS's latest survey have made iron-clad declarations to buy only deforestation-free palm oil. And despite today's announcement, Yum! Brands did not become the ninth. Its commitment only covers the oil it buys for frying. It does not include the oil in its sauces or biscuits and other baked goods, which the chain's restaurants buy from other suppliers. So there is still much to do. You can join UCS's campaign to persuade fast food chains to do the right thing by clicking here. Tell Burger King, McDonald's, Wendy's and other fast food slackers to buy only deforestation-free palm oil.